In a couple of weeks GVMH will begin construction of a new clinic building to serve Osceola and the surrounding area. The structure, pictured above, will be two stories and will house primary and specialty care, lab, imaging, rehabilitation and pharmacy services. The building will be located on the Osceola Square at the intersection of Third and Chestnut Streets. 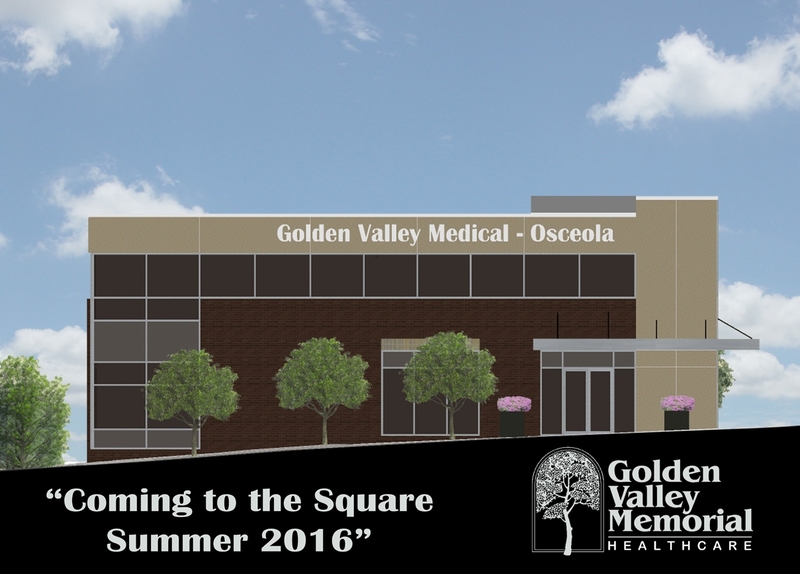 Once the building is complete the current space occupied by Golden Valley Medical – Osceola, will be vacated as it is a temporary location and was never intended to meet the needs of the community long-term. If you’re going to be in the Osceola area on Friday, September 25th at 11:30 am, please make a point to attend the official groundbreaking ceremony. The new clinic will bring much-needed services to the area and help us to meet the health care needs of the community for years to come. The building is scheduled to be open for business by the Summer of 2016.